Teach Tuesday is a series bringing you educational posts weekly! Easter has come and gone, but these dang eggs remain! Kids love them. Izzy especially is obsessed! I don’t have the heart to put them away until nest year or throw them out. I’m sharing how to use your kids love for Easter eggs to create educational experiences. Hide different shapes, letters or numbers in the eggs and have you child either search for the eggs then open them to reveal what’s inside or just place them all in a basket and have them pull each egg out. *Full blog about this activity here. Write an uppercase letter on one half and the lowercase on the bottom half. Have your child match the correct letters. Talk to your child and encourage them. If they get it wrong don’t discourage their attempt. Say something like, “Hmmm this one is letter M and that is letter N, let’s look again for M.” At first they might need you to pick 2 egg halves and ask them to pick from those. After all with multiple choice, your odds are much better with less choices… right? You want to create a positive and fun learning environment. This is as simple as it sounds. Put all the eggs in a basket and as your child pulls them out, count together. First 1-10 and the 11-20. Go by tens when introducing new numbers for counting. Hide the eggs around the house. Talk to your child as they find the egg. “The pink egg is on the couch. The blue egg is under the chair.” Throw the eggs over or into a basket. Use the positional verbiage as you play. 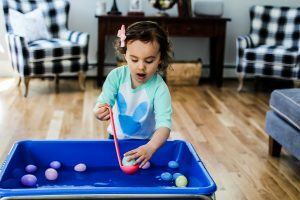 Bring the eggs to bath time or put them into a bin with water for sensory play. Add other objects (while monitoring) such as corks, coins etc. Talk to your child about the objects and introduce or revisit the concept of sink and float. Have fun with those Easter eggs friends! Great ideas! Although I’m a little more ruthless than you. I’ve already started ditching them as I find little egg halves everywhere. Lol they are all over my house. Smart thinking! I never know what to do with the eggs! Great way to re-use the eggs! Eryka, I am so happy that you are still doing these Tuesday posts! I need all the ideas I can get and these are amazing! We have so many eggs spread out everywhere, lol! I was just about to pack up my eggs, definitely going to keep them out and teach a little! Your babe(s) will appreciate it!